Tehran has hosted its own conference on nuclear security to gain support against the pressure from the West and wants to “disarm the world,” the media say. The participants of the nuclear forum that took place in Tehran on April 17-18 and was attended by official and non-official delegations from 56 countries stressed the need to observe non-proliferation, disarmament and the right to peacefully use nuclear technology. The delegates expressed their concern about the existence of weapons of mass destructions, called for efforts to make the Middle East a nuclear-free zone and said that Israel should join the nuclear non-proliferation treaty. Foreign ministers headed 14 delegations at the conference called “Nuclear Energy For All, Nuclear Weapons For No One” and 10 delegations were headed by deputy foreign ministers. Deputy Foreign Minister Sergey Ryabkov, who headed the Russian delegation in Iran, assessed positively the results of the conference. “This forum has become another opportunity for us to bring to the notice of our partners Russia’s position on such issues as non-proliferation, nuclear disarmament and peaceful use of nuclear energy,” he told Itar-Tass news agency. “The statement of Iran’s Foreign Minister Manouchehr Mottaki about the plans to organize the second conference in April next year evidences Iran’s serious intentions to continue the work in this direction,” the official said. 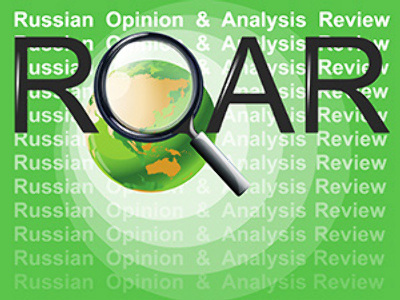 Moscow’s position on the Iranian nuclear program has not changed recently, Ryabkov said. It boils down to continuing efforts to search for political and diplomatic ways of solving the problem, he said. Rather than arguing over the problem, mutual efforts should be made to restore the trust of the international community in the Iranian nuclear program, the deputy foreign minister noted. However, as Iran has not yet fulfilled UN resolutions and taking into account its efforts in stepping up the nuclear program, these factors may make sanctions against Tehran inevitable, Ryabkov said. At the same time, Russia still considers the sanctions “one of the most ineffective steps,” he noted. 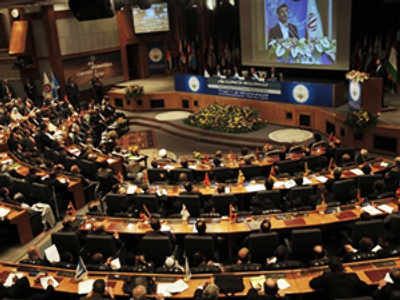 Analysts have described the conference in Tehran as “a PR stunt” intended to divert the attention from a new round of sanctions, Nezavisimaya Gazeta daily said. However, many observers believe that the participation of the Russian delegation was justified, it added. The organizers of the forum in Tehran wanted to stress once again that great nuclear powers should disarm themselves as soon as possible, said Aleksey Arbatov, head of the Center for International Security at the Institute of World Economy and International Relations. Only doing this, such states may ask non-nuclear states to fulfill their commitments, the analyst told the paper explaining Iran’s stance. According to Arbatov, the forum should have eased the pressure on Iran from leading countries that try to force Tehran to obey the resolutions of the UN Security Council and stop its nuclear program. The event was supposed to divert the attention from “Iran’s provocative course of creating nuclear weapons while nobody has any doubts about this course already,” the analyst stressed. At the same time, Arbatov described the participation of the Russian delegation in the Tehran conference as a positive factor. It was a good chance for Russia to explain its firm position on the nuclear problem and disarmament rather than “say yes to Iran,” he said. The participation in the conference was also justified taking into account economic ties between Moscow and Tehran, Arbatov said. Russian officials have repeatedly said that the Bushehr nuclear plant will be launched this summer. The possible new sanctions that are being discussed by the group of six countries are not expected to hinder the launch of the Bushehr plant, Nezavisimaya Gazeta said, citing Sergey Kiriyenko, head of Rosatom, the Russian state nuclear agency corporation. Many observers doubt that the latest nuclear conferences held in the US and Tehran will make a major contribution to solving the Iranian nuclear issue. This was one of the main topics discussed by the participants of the Washington forum. Yet the participants failed to find “the optimal way to make Iran abandon the development of nuclear weapons,” believes Sergey Markedonov, deputy director of the Institute of Political and Military Analysis. Iran is more pragmatic as many may think, the analyst said, adding that Tehran’s foreign policy consists of “many layers”. “It is necessary to find pragmatic reasons and constructive behavior under warlike clerical rhetoric,” he said. External pressure whether it comes from the US or Europe or even supported by Russia and China may only consolidate Iranians on the basis of the patriotic ideology, the analyst said. Gradually drawing Tehran into international projects that are interesting for leading players such as the US, the EU, Russia, China and India may become a more promising course, he noted. It is difficult to solve many problems in the Middle East without Iran’s participation, Markedonov said. Iran’s more active involvement in international affairs could strengthen followers of the pragmatic direction, he noted. Such changes may force Iran if not to make concessions, then “to rationalize the relations with the West and abandon the unnecessary demonizing of the US,” the analyst said. Meanwhile, the Iranian foreign minister has said Tehran wants to resume talks on a nuclear fuel deal with members of the UN Security Council. According to Manouchehr Mottaki, Iranian delegations will visit Russia, China, Lebanon and Uganda within the next 10 days for talks. Earlier Iran rejected an offer to send its low-enriched uranium abroad for further processing and conversion into fuel rods for a research reactor.